So, this is a sort-of follow on from my last Design Tips post “How to create Moodboards in Illustrator”. In that post, I outline my whole process from collecting information from clients to collating images to techniques to putting them together to create a perfect mood board. And since this post starts with a mood board, you should go and read that post ASAP! If you’re not at the stage where you have a mood board yet, this post won’t be as helpful to you. Pin this post and come back to it later when you have a mood board! The following is a technique I use for creating awesome color palettes, and like I said, we start with a mood board. Here’s a mood board that I have recently made for a client with the techniques I wrote about in that previous blog post I just talked about. I already knew what kind of imagery and colors my client was drawn to, and what colors she wanted to stay away from. 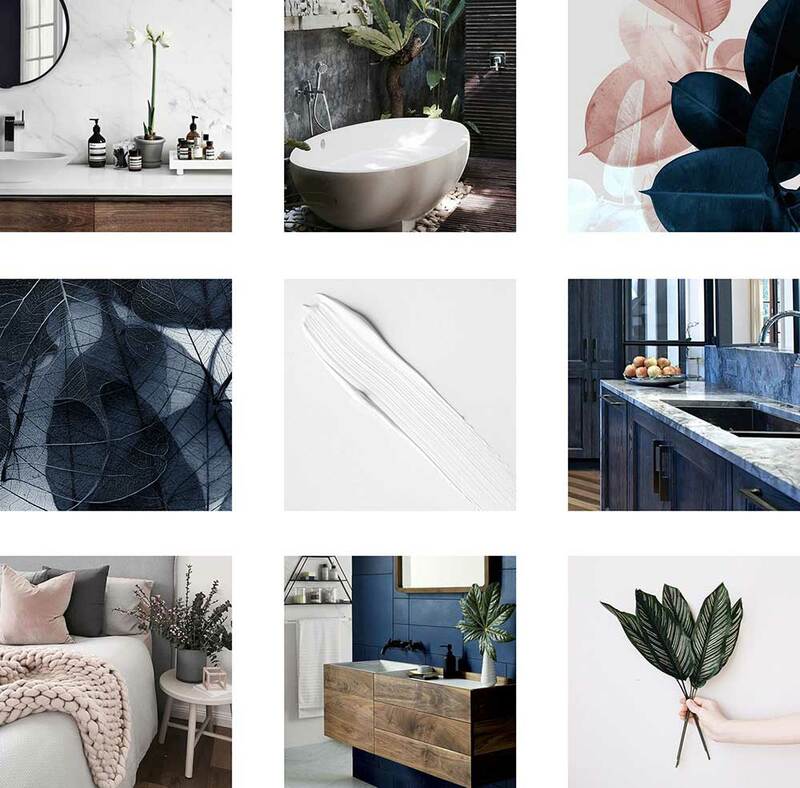 You can see that this mood board has an overall navy and neutral vibe, but we need to refine this and create a go-to color palette for the brand. So how do I create the perfect color palette from this mood board? Here’s my trick! It’s all thanks to this free online tool called Coolors, so go ahead, start the generator, it’s free (you don't even have to log in)! Once you’ve clicked that button you will see that Coolors has generated 5 different colors for you. These are just random right now, but you can play around with each of them and change them. Each panel of color has 4 buttons, a hex code, and a name (love the names!). Starting from the top, click the first button to reveal alternate shades of the color you clicked. The second button is a click and drag, if you want to see the different colors next to each other. The third button is a standard color adjustment panel where you can change the color to anything you like. And the fourth is a lock button. This comes in handy when you regenerate the color scheme, but want to keep certain colours. Now, try locking a color and hitting the spacebar, and watch it regenerate! You can do this as much as you like, I think it’s a great tool for experimenting with different colors. We'll come back to this section later. TIP: Sometimes if you’re on smaller screen size the panel can be slightly cut off after you upload your image. Just go to your browser panel, probably top left, and Zoom Out (for Chrome click View > Zoom Out) until the panel is better positioned on your screen. Once you've uploaded your image, you can see down the bottom that it has automatically generated colors for you from your moodboard! You can click on the colors and adjust them by clicking on the image. It will pull color from wherever you click. If you hit the Auto button, it will regenerate a new color palette. If you click Collage it will automatically download an awesome color palette collage to your computer, try it out! And once you’re happy, or close to happy, with your palette, you can click OK and it will populate the original color palette with the new one you just created. You can make further adjustments and tweaks here. If you’re happy with your palette now, you can then copy these Hex Codes over to whatever design program you use, or, you can use the Export or Save tools at the top right. It may be handy to export it and save it on your computer. This is the color palette I ended up with for my client! There's plenty of different "rules" to follow for the perfect color palette around the internet, and while these can be helpful, you should definitely use whatever you think looks best. A good rule of thumb is to have at least two dark colors and two light colors, the rest I think is just whatever works for your brand and looks good! I hope you've found my process useful. Coolors is an awesome programme and I encourage you to keep playing around with it and make the most of all the free features! Let me know in the comments below your go-to technique for creating the perfect color palettes!